There are 507 riders from 41 nations registered with the 18 UCI World Tour teams for 2014. The average age of a rider is 28 years and 1 month. The oldest rider is the 42 year-old Jens Voigt (Radioshack) whilst Cannondale’s U-23 World Champion Matej Mohorič is the youngest pro aged 19 and a quarter. Here’s a look at the 2014 peloton in numbers. There’s a look at rider age, the “oldest team” and also analysis of how many pros come from each country and more. Tinkoff-Saxo assume the title of pro cycling’s gerontocracy and have three of the peloton’s top-10 old croans with Karsten Kroon (37), Nikki Sorensen (38) and Matteo Tosatto (39). Radioshack-Trek were the oldest last year but Trek Factory Racing are rejuvenated… by the retirement of Chris Horner and Andreas Klöden but they still retain the peloton’s oldest rider Jens Voigt. Meanwhile Argos-Shimano remain the young pups of the pro peloton. There’s a cluster of older riders who affect the average age. 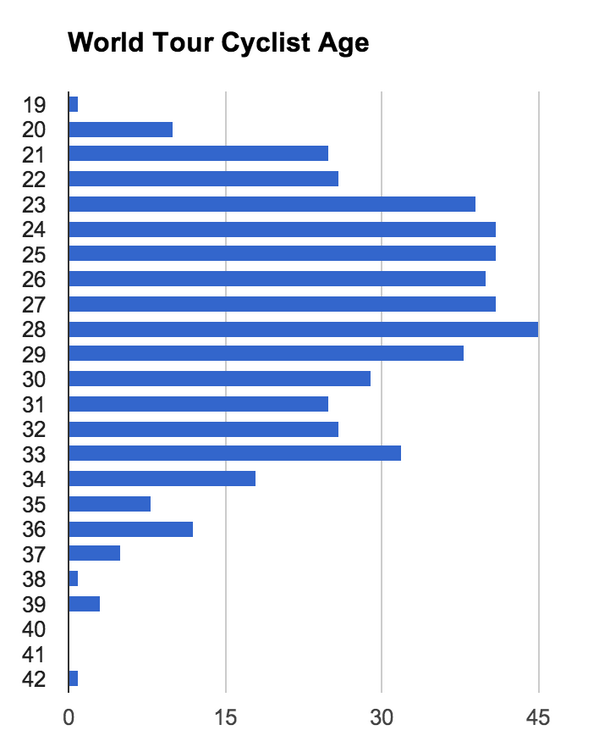 The mean age for the World Tour is 28 years and one month but the median is 27 years and seven months. Note Jens Voigt was ranked as the world’s top amateur and the Peace Race in 1994 before Matej Mohorič was even born. Outside of the top-20 we have Austria, Luxembourg and Slovakia with five riders, Belarus on four, Czech Republic, Ireland, Lithuania and Sweden each have three, China, Croatia, Japan, South Africa, Ukraine all have two and there’s one each for Argentina, Brazil, Costa Rica, Eritrea, Estonia, Finland and Latvia. Last but not least, a novelty for 2014 with Malaysia’s Loh Sea Keong joining Argos-Shimano. The big change for 2014 is the increase in Frenchmen. It’s arithmetic given Europcar ride into the World Tour and so bring a lot of extra French riders into the mix to overtake Italy. 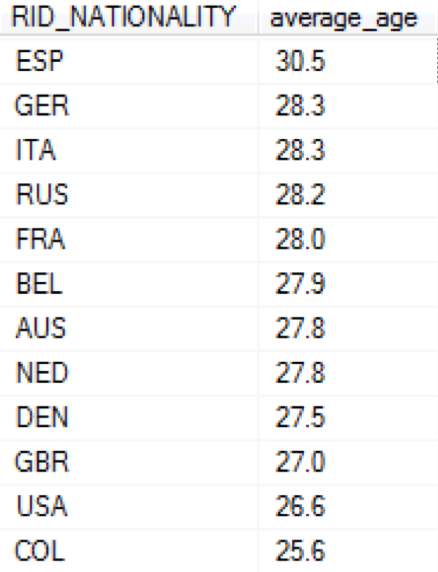 The flipside is the exit of Belgian and Dutch riders, down six and ten respectively with Vacansoleil-DCM going and the same but worse for Spain after Euskaltel hung up for good, down from 50 to 33 riders. Australia go from 35 to 30. Age numbers used above are decimal and not duodecimal, eg 25.5 is 25 years and six months and not 25 years and five months. pedant alert: Petacchi’s birthday, according to PCS.com, is 3 january – today! (not 23 oct 71). coincidental observation: Tossato and N Sorensen share the same birthday, a year apart, and the youngsters Bettiol and Bonifazio share the same birthday! As for sharing birthdays, 18 February 1985 saw Fabio Sabatini, Christian Salerno and Jos Van Emden born. 21 February 1985 is also a day for three riders, although with twins, the Velits brothers and Christian Meier. Nice artice with interesting statistics. One tiny mistake though. Alessandro Petacchi was born on the 3rd of january 1974. 78 Frenchman and not one of them capable of winning a grand tour or a monument. Which nation is the best on a per rider basis? 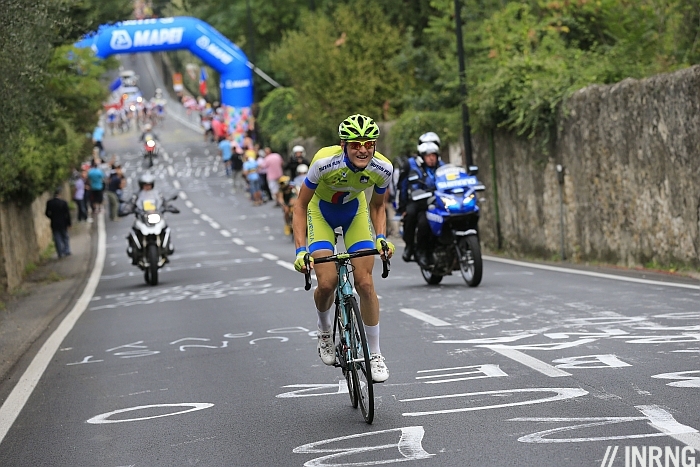 Slovakia with five riders do well thanks to Sagan and Peter Velits too. Portugal have six but a World Champion. Harsh about the French. A big stage race seems too much to ask but there’s an outside chance for a monument with the likes of Démare, Bardet, Pinot, Vichot and even Voeckler. I would say the three Czechs do also very well with Kreuziger and Stybar (not to forget Konig in Pro Cotinental NetApp). How about us Irish? We’re not doing too bad… Here’s hoping Phil Deignan will come to the fore driving the Sky train up hills in the big tours. Harsh about the French? Doesn’t it say more about the poor economic health of pro cycling than anything? The concentration of French (ASO taking the lead) money? More about the lack of non-French money interested in investing in top level pro cycling? Hard to say. If anything French teams don’t need a World Tour licence because they’re near-guaranteed to ride the Tour de France every year via wildcard. Norway isn’t doing too bad – EBH, Hushovd, Kristoff and Nordhaug as well as Rasch (retires after PR this season) and neopro Vegard Breen. How difficult is it to say or print ColOmbia? I got that earlier and it’s fixed… but the chart takes time to update again. Thanks for putting this together. Interesting read yet again. Chris Horner is without a contract. However, he has not retired. What happened with the Movistar opening created by Alex Marques’ positive? I was under the impression they would fill the slot with Sammy Sanchez. I thought Igor Anton got that spot. Going to be a gap at Taxo-Sinkoff with Rogers clen +ve ? And dont forgett other two czech riders, Vakoc and Barta. Does it look like classics riders & domestiques can prolong their career longer than grand tour top 10 riders? Or have all the GT riders been removed from their profession for other reasons? I suspect competing for multiple grand tours has a more damaging effect than competing as a one day specialist, so they retire earlier for one of several reasons, worn out, have enough money to retire comfortably, or banned. Don’t forget that guy, what’s his name… the Kenyan; I mean South African, or is he Monegasque…? I’m loving the use of the 2 decimal points for rider nationalities. I scrolled down in hope that you had allocated parts of riders to different countries! I was thinking of say Chris Froome: Britsh 50% / Kenya 50% or Bradley Wiggins: British 25%, Belgium 50%, Australia 25%. A real blow for Spain. We will have to see what Alonso does but with Bettini his team sounds international more than Spanish.